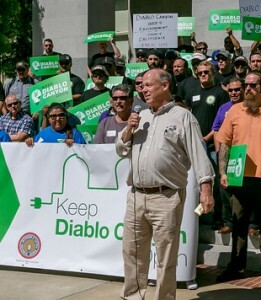 More than 100 IBEW 1245 members and supporters descended on the State Capitol on April 4 to deliver an important message – Keep Diablo Canyon Power Plant Open. 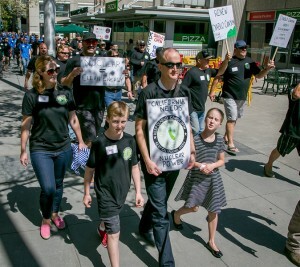 A busload of Local 1245 members who work at Diablo Canyon traveled up to Sacramento for the rally, where they were joined by elected officials, union leaders, Local 1245 Organizing Stewards, union staff and supporters. 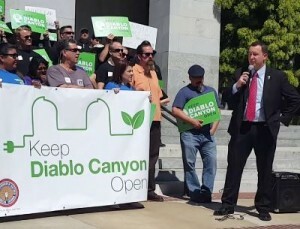 Local 1245 Business Manager Tom Dalzell carried home the message that the next generation of Californians are relying on Diablo Canyon in a multitude of ways, both environmental and financial. Kevin Garduno, an operator at Diablo Canyon who recently became the head of the union’s campaign to keep the plant open, took a moment to address the safety concerns that some members of the public have when they think about nuclear power. Representatives from other local unions also joined the rally. John Mader, president of ESC-IFPTE local 20, which represents 350 engineers and designers that work at Diablo Canyon, as well as the scientists who work at the Environmental Protection Agency (EPA), emphasized the fact that the nation’s top environmental experts are advocating for nuclear power as a clean and safe alternative to dirty fossil fuels. Although IBEW Local 1245 is not an official member of the State Building and Construction Trades Council, its leader, Robbie Hunter, joined the rally to underscore the plant’s important history as well as its flawless safety record. Hunter was not the only notable state leader who spoke at the rally. Several members of the California Legislature also came out to voice their support for Diablo Canyon. This summer, the State Lands Commission will decide whether or not to renew PG&E’s current license that allows Diablo Canyon to remain in operation, and Local 1245 intends to continue speaking out and lobbying the members of the Commission to make sure they understand the critical role that Diablo Canyon plays in both our economy and well as our clean energy future. 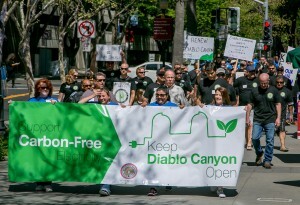 Learn more and get involved at www.keepdiablocanyonopen.com.